eCite - Communicating Expert Opinion: What Do Forensic Scientists Say and What Do Police, Lawyers, and Judges Hear? Communicating Expert Opinion: What Do Forensic Scientists Say and What Do Police, Lawyers, and Judges Hear? Forensic scientists’ expert opinions are used increasingly in the course of police investigations, out-of-court settlements, and trials. For an expert opinion to benefit the community, it must be understood adequately by those charged with using it as a decision-aid. 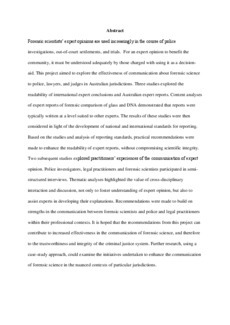 This project aimed to explore the effectiveness of communication about forensic science to police, lawyers, and judges in Australian jurisdictions. Three studies explored the readability of international expert conclusions and Australian expert reports. Content analyses of expert reports of forensic comparison of glass and DNA demonstrated that reports were typically written at a level suited to other experts. The results of these studies were then considered in light of the development of national and international standards for reporting. Based on the studies and analysis of reporting standards, practical recommendations were made to enhance the readability of expert reports, without compromising scientific integrity. Two subsequent studies explored practitioners’ experiences of the communication of expert opinion. Police investigators, legal practitioners and forensic scientists participated in semi-structured interviews. Thematic analyses highlighted the value of cross-disciplinary interaction and discussion, not only to foster understanding of expert opinion, but also to assist experts in developing their explanations. Recommendations were made to build on strengths in the communication between forensic scientists and police and legal practitioners within their professional contexts. It is hoped that the recommendations from this project can contribute to increased effectiveness in the communication of forensic science, and therefore to the trustworthiness and integrity of the criminal justice system. Further research, using a case-study approach, could examine the initiatives undertaken to enhance the communication of forensic science in the nuanced contexts of particular jurisdictions.